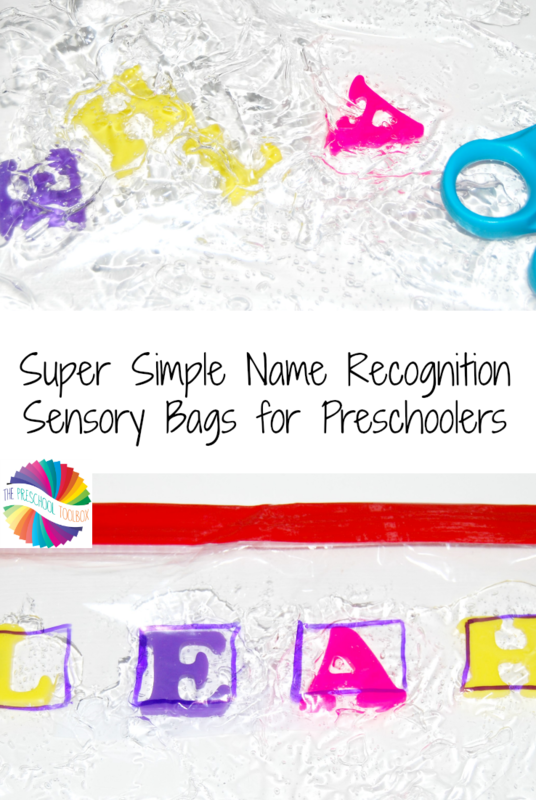 Super Simple Sensory Name Recognition Bags for Preschoolers! Super Simple Name Recognition Sensory Bags for Preschoolers! Some of the first letters preschoolers learn to recognize are the letters in their names. Exploring letters and names by engaging sensory inputs helps learning stick for young kids. Come try the simple name recognition sensory bags to encourage early letter and name recognition skills with your own preschoolers at home or in the classroom. Disclosure: this post and others within the blog contain affiliate, sponsored, and/or distributor content and links. Please see the disclosures page for full information. 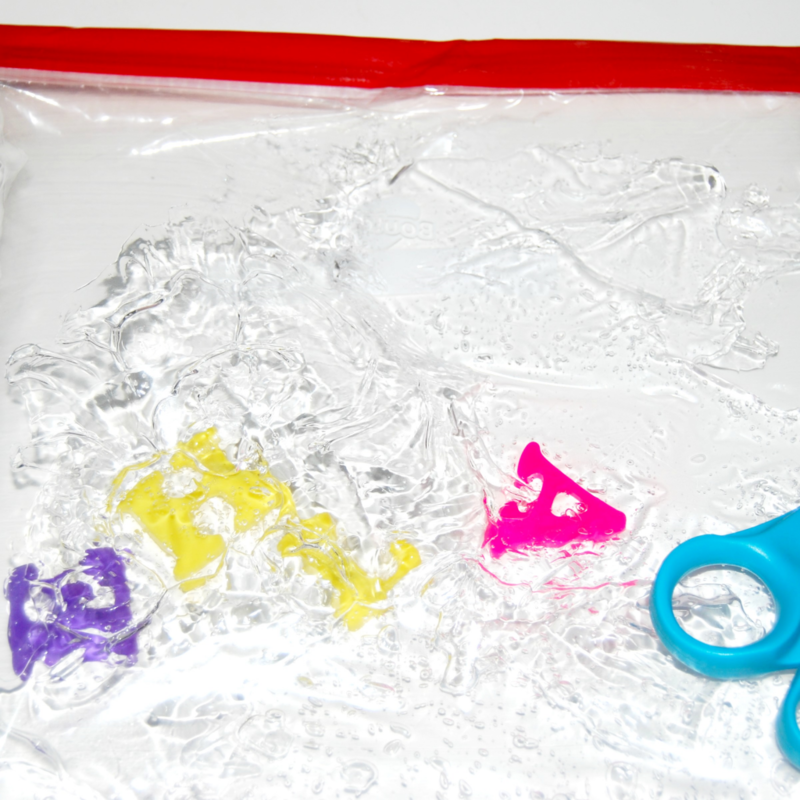 Pour clear hair gel into a gallon sized plastic bag. Add plastic letters for a child’s name and close the bag. Duct tape the top of the bag and cut away excess tape (to prevent accidental spills). Draw the number of squares (near the top of the bag) that correspond to the number of letters in a child’s name. For younger children, write the letters inside the squares so children can match the plastic letters to the letters inside the squares. Invite your children to look at the letters inside the bag. 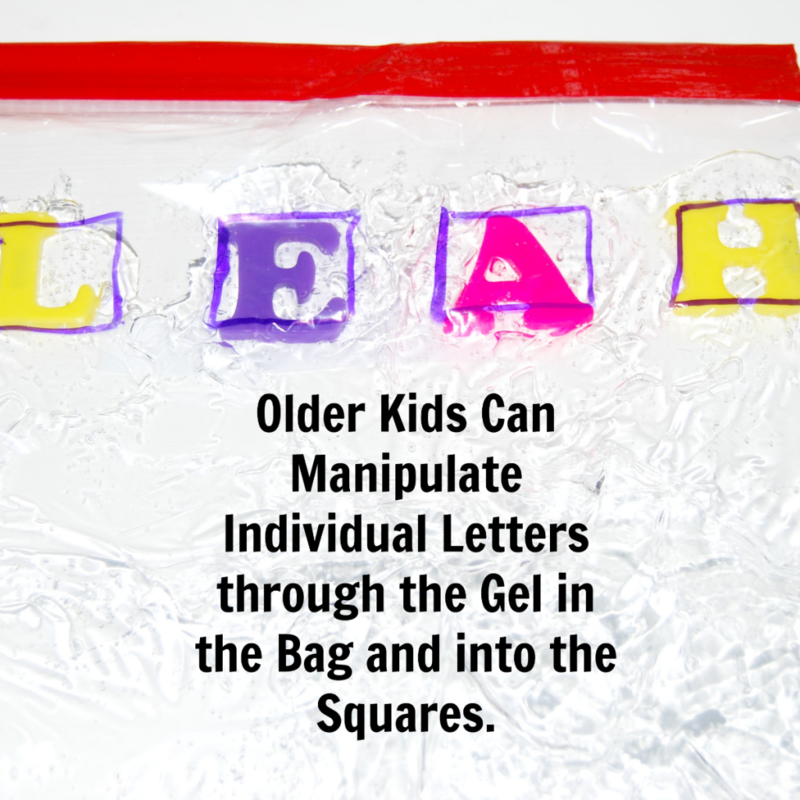 Kids must try to manipulate the letters into the squares at the top of the bag to form their own name. It’s great fine motor and sensory play while working on name and letter recognition skills. 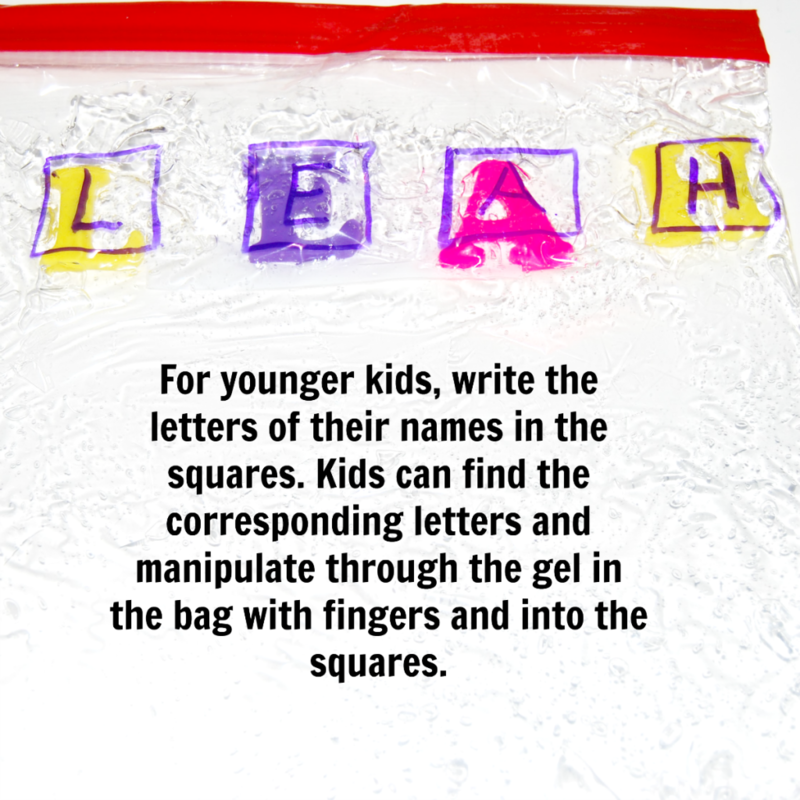 For younger kids, write letters of a name inside the individual squares on the sensory bag as a guide. Add plastic magnetic NUMBERS to the sensory gel bags. Kids can work on ordering numbers 1-5 or 1-10. Draw 5-10 squares and invite kids to manipulate the corresponding numbers through the gel and into the correct number order. Draw circles on the bag and write a small number on the circle (numbers 1-5). Have kids work to move corresponding numbers into the circle. Small objects can also be placed inside the bag for kids to move the correct number of items into the numbered circles. It’s a fun way to work on subitizing skills in preschool. 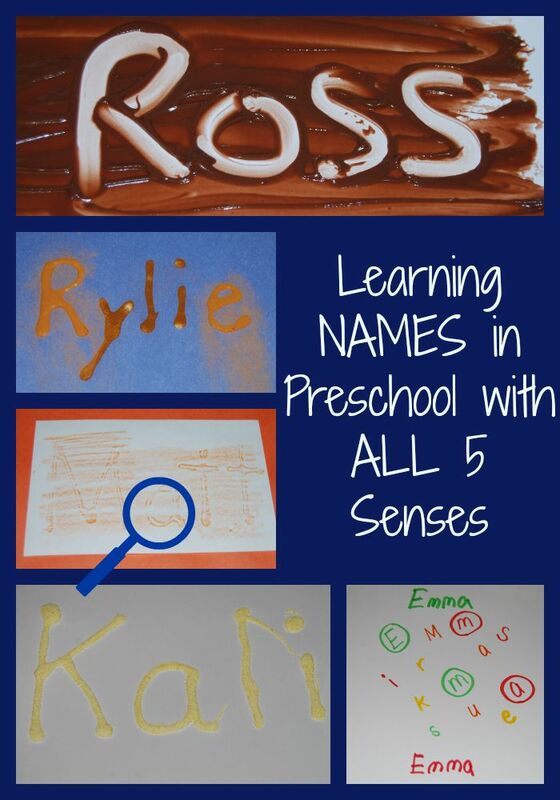 For more ways to PLAY with Sensory Name Recognition, try some of the activities here. 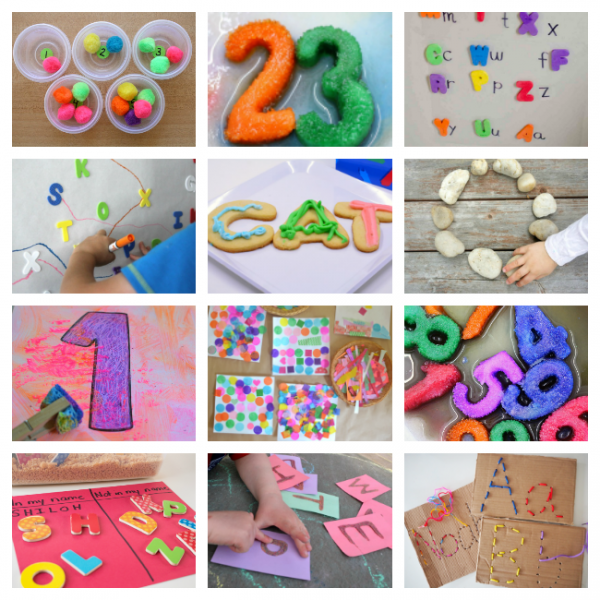 For ways to introduce the ABC’s and 123’s to preschoolers through hands-on playful learning see here. 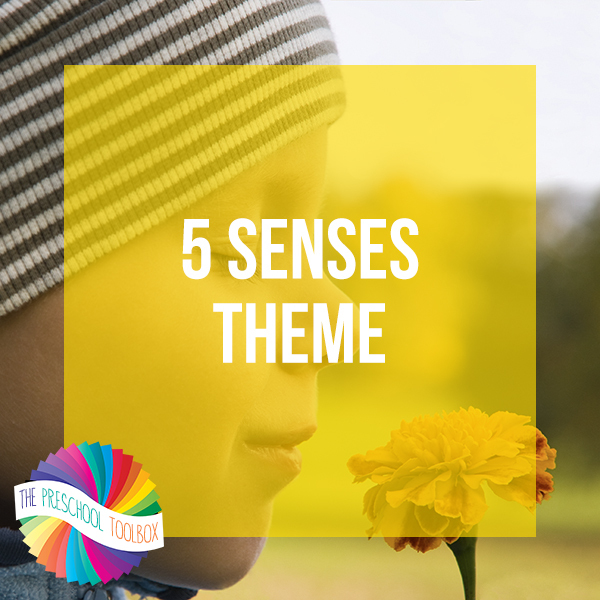 Your kids will also enjoy learning through ALL 5 Senses – the theme includes activities and suggestions for playful learning using the sense of sight, hearing, taste, touch, and smell. The eBook is available for immediate use and contains all you need for explorations in math, science, music, literacy, large motor, and dramatic play all year through.